First of all, I owe you the result of a question I posted in my previous blog about the Leiden manuscript BPL3603. I wondered whether anyone could help me find the name of the Archduchess of Innsbruck who was mentioned by Franciscus Mercurius van Helmont. The world of Twitter soon came up with the answer from Maartje van de Kamp (@Lizzyin2015): it must be Anne de Medici. I cannot agree more. Anne de Medici married Ferdinand Charles the Archduke of Further Austria in 1646 and at the time she spoke to Franciscus Mercurius in 1650 she was still childless. She eventually had two surviving children: the Archduchesses Claudia Felicitas of Austria and Maria Magdalena of Austria. A third child died at birth. 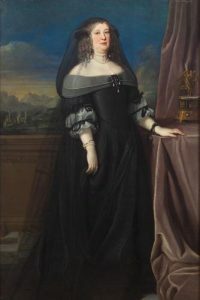 Anne died in the year 1676, which would explain the reference to the ‘last-deceased empress’, as it is in 1676 that van Helmont is telling this story. Many thanks to Maartje! 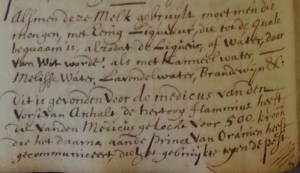 I would like to continue this post discussing the impact of noble men and women in the manuscript that has been the centre of the series on Dutch Medicines. Two month ago I had the pleasure of spending two weeks at Leiden University Library, and I had the time to re-visit BPL3603. Reading the manuscript, it struck me how often the names of famous people were used as a validation for the efficacy of certain recipes and drugs. A good example was the fertility drug mentioned above to which the Archduchess of Innsbruck lent her authority. But there are several more. 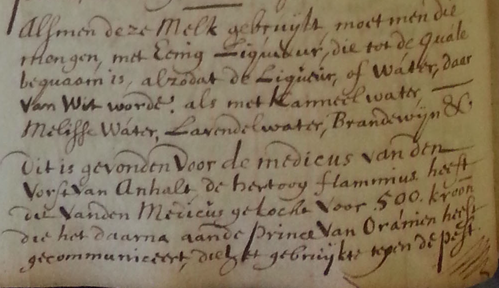 On page 32 of the manuscript we find a recipe for a remedy to re-gain one’s eye-sight within 14 days, even if it had been lost for 7 years (Een kostelijke Medicine om het gesicht wederom te krijgen (al had men ‘t zeven jaren quit geweest) in 14 dagen tijds). University Library Leiden, MS PBL3603, p. 32: Count Palatine Frederick approved of the recipe. The recipe is followed by a little statement saying that Count Palatine Frederick has tried this and found it good, even on people who have been blind for seven years. Most likely this is the Winter King, or Elector Palatine Frederick V (1596-1632) who lived in The Hague after he had to flee Bohemia in 1622 until his death. Thus, this is a combination of royal approval and local witness to the cure. On page 34 another recipe for eye diseases was time tested by the ‘Margravine of Ansbach’. It is unclear to me who is meant here; there are again several options. The principality of Ansbach is located in Bavaria in Germany and although I have not been able to find the connection between Ansbach and the Netherlands at the time that the compiler of our manuscript was writing. Fragment from Leiden University Library, MS BPL3603, p. 52. Many noble men and women have tried the recipe for the stone that is written on page 52. And they have found it ‘waarachtig‘, or truthful. Detail of drinkable balsam for the Prince of Orange, Leiden University Library, MS BPL3603, p. 84. My final example describes a recipe for ‘milk, cream, or butter of sulphur’, which turns out to be a generally useful and invigorating balsam. It needs to be drunk as a mixture ‘with any liquor or water that is appropriate for the ailment’. All of this was found by the doctor of the Prince of Anhalt; bought by the Duke of Flanders for 500 crones; and then communicated to the Prince of Orange to use against the plague. Again, we find that a recipe came from Germany to the Netherlands, and its efficacy is proven by the fact that noble people used it. Subsequently, this recipe was brought to the geographical region of the compiler by the reference to the Prince of Orange. The date of the transmission of the recipe is not mentioned, which makes it hard to guess which Prince we are talking about. However, any of the Princes of Orange would have at least spent some of their time in The Hague. All is to say that the efficacy of recipes seems measured not only by its power to cure but also by its power whom to cure. In the first instance I was surprised about the German noble men and women named in the manuscript, as it seems to contradict the manuscript’s local aspects. We have previously seen how the compiler used local Dutch sources, see for example Saskia’s blog about the hare. However, most of the people named are linked to the Low Countries and more specifically to the West of the Northern Netherlands. This might be another indication that the compiler of the manuscript was somehow linked to that part of the country himself, something that will be further explored in future blog posts.